US Open organisers say umpire Mohamed Lahyani went 'beyond protocol' in his on-court pep-talk with Nick Kyrgios. Lahyani left his chair at a changeover to talk to Kyrgios, who was trailing by a set and a break against Pierre-Hugues Herbert in Thursday's second round. The 52-year-old was heard telling Australian Kyrgios: "I want to help you. This isn't you. I know that." "Lahyani was advised to adhere to proper protocols in all matches that he officiates," added the US Open. "Lahyani will continue to officiate during the 2018 US Open. His performance will continue to be evaluated, as will that of all chair umpires throughout the course of the US Open." 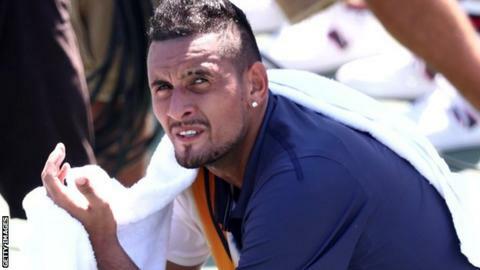 The United States Tennis Association (USTA) had previously said that Swede Lahyani left his chair to check on Kyrgios' condition because he could not hear him properly and was concerned the player might need medical attention. World number 30 Kyrgios went on to win the match against Frenchman Herbert 4-6 7-6 (8-6) 6-3 6-0 to set up a last-32 meeting with second seed and five-time champion Roger Federer. The 23-year-old said it was "ridiculous" to suggest Lahyani's words had sparked his resurgence. But Herbert believes it was "the point something changed" and said Lahyani's actions were unnecessary. Lahyani is one of the longest-serving umpires having worked on the ATP Tour for more than 20 years. He was in charge of the John Isner's record five-set win over Nicholas Mahut at Wimbledon 2010 and the 2013 men's final at the All England Club.